Works & Process Holiday Concert at The Guggenheim Museum. 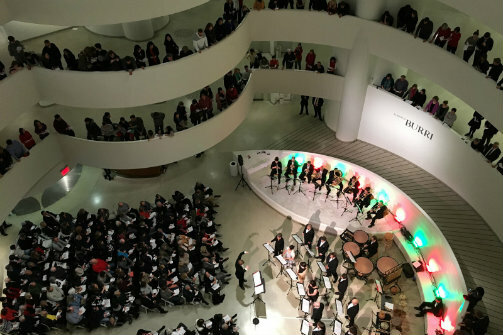 BOTTOM LINE: The Guggenheim's Works & Process Holiday Concert presents new and traditional music in a unique space. The Guggenheim's Works & Process program gives musicians and artists a chance to showcase both new works and works in progress. Each year, the museum gives a holiday concert rendition of their regular program, which this year featured music by the Vox Vocal Ensemble, and was conducted by George Steel. Although the concert primarily consists of Christmas classics, this year it also featured a new piece composed by Nicho Mulhy. The concert primarily focuses on vocal performances by Vox Vocal Ensemble, who perform mostly acapella, but are also accompanied by trumpet, trombone, tuba, violin, and cello. The ensemble performs new reworkings of classics, creating something fresh out of something old. They begin the evening from the top level of the Guggenheim rotunda, slowly working their way down to the bottom, an arrangement that serves to engage those audience members in the highest levels, arousing an air of intrigue. The singers convey the impressive possibilities of vocal music, their voices echoing through the uniquely shaped space. The Christmas carols give the audience an opportunity for participation, creating a rousing spirit in anticipation of the holiday. While filing out post concert we dallied as long as possible, much to the chagrin of the security guards, taking in Guggenheim's current Art in China After 1989. Although the Works & Process holiday concert has since passed, there are many upcoming programs throughout the year. While seats on the ground floor can sell out fast, there is usually room to watch and listen from the many levels of the rotunda. Works & Process Holiday Concert is performed by the Vox Vocal Ensemble and conducted by George Steel.